Exploring the 100 year mystery of the devil's triangle. The 100-year Mystery Of The Bermuda Triangle has opened up its ugly face again, and this time in a major way. A week ago, (mid-march 2017) news of an ongoing massive hunt in the Atlantic Ocean by the US Coastguard for a missing private plane carrying a couple and their two kids. Today, after much research, we bring you explanations. 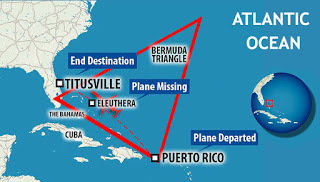 It was mentioned that this plane vanished in a region of the western Atlantic Ocean known to have been swallowing up planes and ships for over a hundred years….the Bermuda Triangle often called the Devil’s Triangle. In a follow-up article, I introduced the history of this mysterious region with the story of how six Bomber planes of the United States Navy vanished there in December 1945. That bizarre incident of 1945 wasn’t the last as you now know but it wasn’t the first either, certainly not for the US Navy. It merely served to draw global attention to a phenomenon that had been going on for so long. For years before the incident, ship, and planes had been reporting critical malfunctioning of their navigational instruments and strange magnetic forces within the region of the Bermuda Triangle. The incident of these six planes wasn’t even the worst, the fate which befell the 19,000-ton vessel, the USS Cyclops was worse. The USS Cyclops was sailing from Barbados to Norfolk in Virginia in March 1018 when it vanished completely from the surface of the earth without making even a single distress call and without a single scrap of wreckage ever being found anywhere on the high seas. That ship had a crew of 309 men and not one of them was ever heard from again …both ship and crew vanished into thin air. After the incident in 1945, the Bermuda Triangle become a legend the world over and this it is why it is a word or rather a term in the English dictionary today. Many called it The Devil’s Triangle, to others it was the Triangle of Death, The Graveyard of the Atlantic Ocean, The Hoodoo sea. In the four decades that followed the 1945 incident, with people watching and recording now, the Bermuda Triangle swallowed up over 140 ships and planes without a trace. The following is a list of some of these vanished crafts and the people in them. 1947: US Army plane, C-45 Superfort vanished 100 metrical miles off the Island of Bermuda. 1948: A Four-engine Tudor IV disappears with 31 people on board. 1948: A DC-3 aircraft goes missing with 32 people on board including crew and passengers. 1950: A Giant US Air Force Globemaster aircraft disappears completely. 1050: An American Ship, a Freighter 359 ft long, SS Sandra, sinks without leaving a trace. 1952: British York transport plane vanishes with 33 people aboard. 1954: US Navy plane, a Lockheed Constellation disappears completely with 42 people on board. 1956: US Navy special seaplane, a Martin P6M, vanishes with ten people aboard. 1962: US Air Force aircraft, a KB-50 tanker plane disappears without a trace. 1. The American ship, the Marine Sulphur Queen, a 425 feet long Freighter vanishes with everyone on board. Never any distress calls, never any wreckage found. 2. Two US Air Force Startrotankers vanishes without a trace while out on a simple training mission. 1967: A US Military YC-122 plane converted to a cargo plane vanishes. 1970: A French ship, a freighter, Milton Iatrides, vanished with its entire crew – never a trace of it anywhere. 1973: A German ship, a 20,000-ton Freighter, Anita, vanished with its crew of 32. These are just the major incidents of those four decades till the 1970s when the Bermuda Triangle had its highest period of publicity, with all kinds of stuff published about it. Writers have come up with all kinds of captivating explanations for these disappearing acts from huge ‘undersea black holes’ to Volcanos on the ocean floor, Time wraps, giant sea monsters, giant water sprouts and even reverse gravity. The most fascinating theory suggested that aliens and UFO were collecting earthling specimen in the area. Having examined all possibilities, the one sure thing I can tell you about this region is that under the sea there is to be found some of the strangest creatures and earth features one can ever imagine. There have been sighting of mermaids off the shores of islands within the region, strange sea monsters too. Underneath the surface of the sea is a mountains region with bottomless valleys that make up some of the deepest and darkest places ever found beneath the oceans. No explorer, whether machine or man, can go that deep, hence anything that falls in there is never found again…and this accounts a lot for the term ‘vanished’ being used so often to describe missing vessels and planes. All these are merely a few known facts. There are no real explanations as to why ships and planes really go missing within this particular area of the sea known as the Bermuda Triangle.